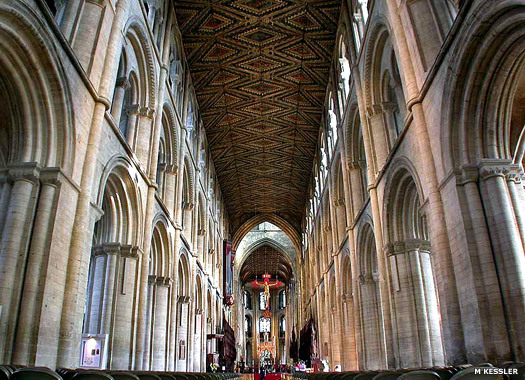 Peterborough Cathedral, or to be more precise, the Cathedral Church of St Peter, St Paul, and St Andrew Peterborough, was constructed between 1118-1238. A monastic church was founded on the site in AD 655 by the Mercian king, Peada, but this was destroyed by the invading Danish army in 870. This view is of the west front. 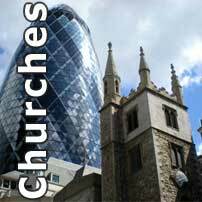 The second version of the church was built in 972 as part of a Benedictine abbey, but this burned down in an accidental fire in 1116. The third and current version has this nave with a grand Italianate vista through the choir to the southern Italianate ciborium and the apse, with an overhanging Italianate crucifix. While this scene of Medieval life was a reality, the Benedictine monastery was enjoying a three hundred year span of prosperity, until it was closed by Henry VIII in 1539. 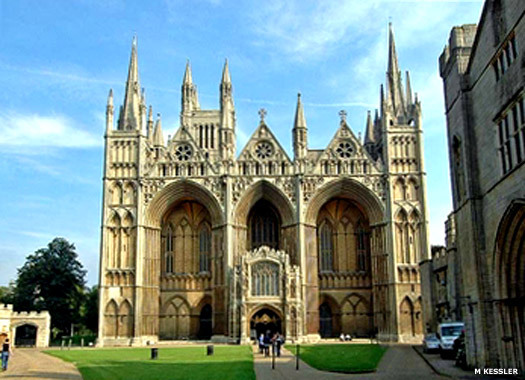 Two years later Peterborough Abbey church became the cathedral of the new diocese of Peterborough. 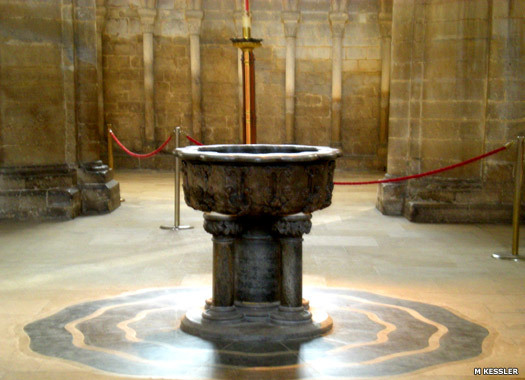 The font, which marks the starts of a Christian's journey in faith, stands at the centre of the nave (since being moved there in 2008 from the north-west transept). This thirteen century bowl was presumably thrown out with the dissolution of the monasteries, and was only 'rediscovered' in the 1820s, in a canon's garden. Now supported on a Victorian base, it was made from Alwalton marble. 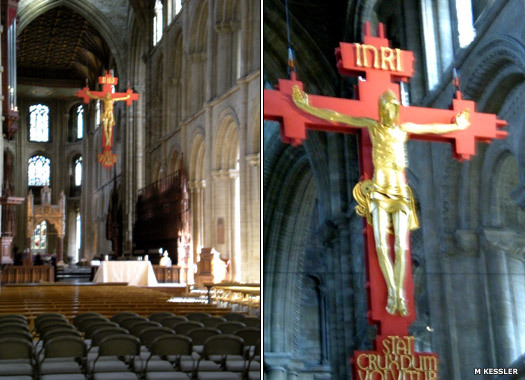 The hanging crucifix or rood was designed by George Pace in 1975 with a figure by Frank Roper. The inscription in Latin, 'Stat crux dum volvitur orbis', translates as 'the cross stands whilst the earth revolves'. 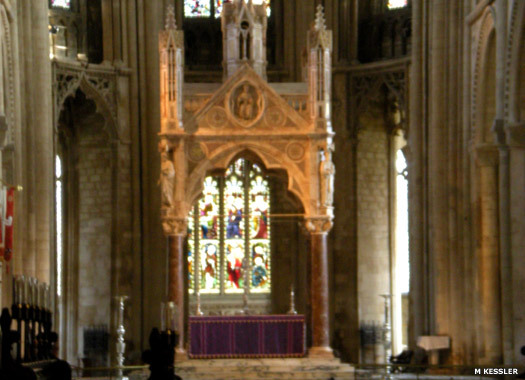 The refurbishment which followed the rebuilding of the tower in 1882 included the creation of the marble tesserae floor, the ciborium or altar canopy, and the Cathedra (the bishop's throne) seen here. A close-up of the stained glass windows at the far end of the cathedral can be seen later. 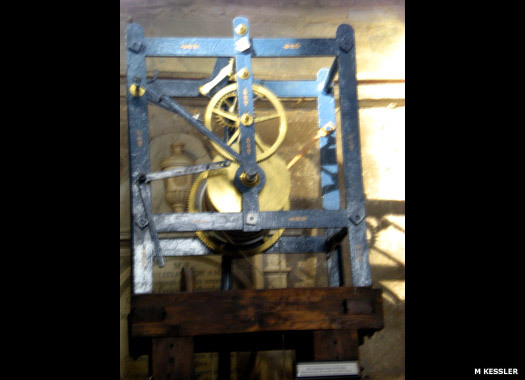 Opposite the effigy of Abbot Benedict (abbot between 1177-1193) is the mechanism of former cathedral chiming clocks. 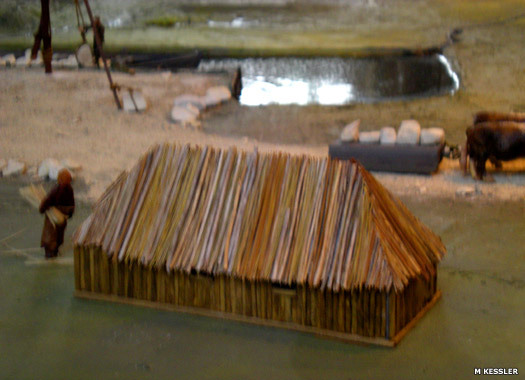 Its earliest parts date back to the fifteenth century. 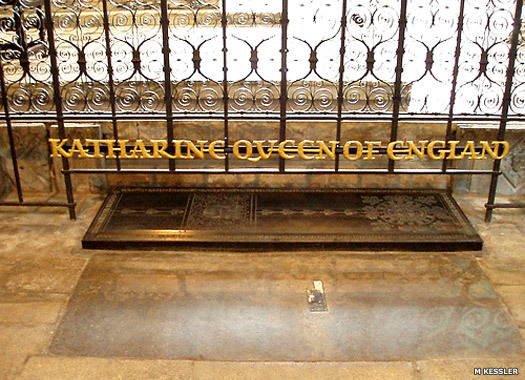 Following her death at Kimbolton Castle, in January 1536, Katharine of Aragon was buried in the North Aisle near the High Altar, whilst the other Tudor queen to be buried here, Mary Queen of Scots, lay on the opposite side of the altar, though her body was moved to Westminster in 1612. 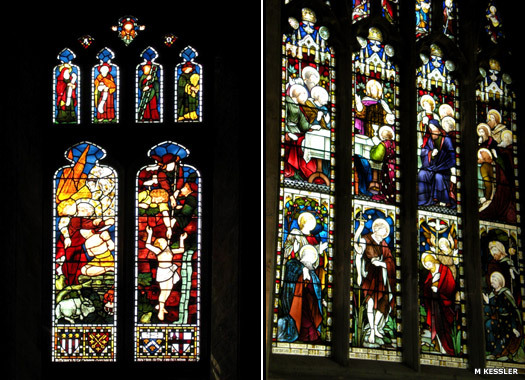 Cromwell's soldiers destroyed all the stained glass windows, plus the High Altar, the medieval choir stalls and all the monuments and memorials in the cathedral in 1643. The replacements are much lighter in tone and setting, making the cathedral itself brighter inside than many others. 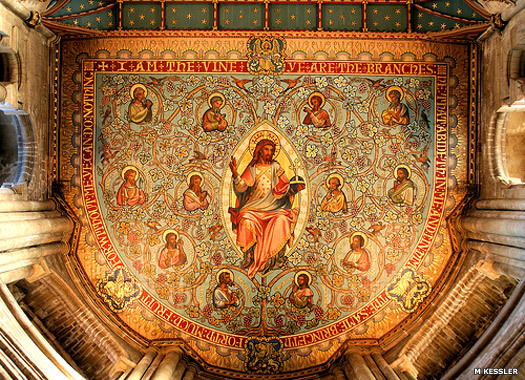 The apse ceiling was completed by Sir George Gilbert Scott in 1856, although it is a reconstruction of the earlier ceiling which was destroyed by musket fire from Oliver Cromwell's soldiers in 1643.